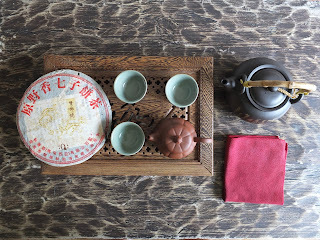 Taetea (we call the company Dayi in our part of the world) in 2015 introduced a sampler box of their teas. This very large presentation box (I placed a gaiwan on the box to give you a sense of the size) was very fancifully designed with 10 compartments within the box. 30 different Dayi teas were individually packed in the box, each pack containing 30g of tea. There were 15 raw teas and 15 ripe teas. Information of the box indicated that the tea were of various ages from 2007 to 2015. The intention of this sampler box was to give the buyer a better perspective of Dayi tea, the large assortment of raw and ripe tea and at the same time allow the buyer to 'taste' the different ages of the tea. I personally felt that 30g was a good minimum sample size as it will allow the tea drinker to have at least 3-5 brews of a tea so as to have a better appreciation of that tea. Although you get a total of 900g of tea, the overall size and weight of the box may deter some online shops from carrying this product. So if you are overseas and want a good tea souvenir to carry home, this Taetea sampler box may make a nice gift for yourself or for a Chinese tea drinker friend. Just make sure to have luggage space for this sampler box. Valentine's Day is this coming Tuesday, Feb 14. It is the time of the year for a few romantic gestures. A gift to your tea lover partner may demonstrate your passion for everything hot and steamy. Get ready to infuse your love by giving this heart shaped box containing pu erh balls wrapped in pastel colors suitable for this occasion. Produced by Xiaguan Tea Factory, this heart shaped tin contains 22 balls of pu erh, 11 raw and 11 ripe. Turn on the kettle and be prepared for a wild night of tea drinking session. It will be a little hard to over infuse your tea as each tea ball is only 3g of tea. And to my new readers....I hope you will know by now that Chinese tea drinker friends are fun people to be with. Really. Happy Valentine's Day! I gave myself a treat during the Chinese New Year weekend by opening a 2004 'Double Lion' cake. This cake was produced by Qiu Xiang teashop, a Malaysian tea company and used the 'double lion' label on the wrapper. You can just figure out the 2 prancing lions on the wrapper in the third pix. I had remembered that this lion label were also seen on old vintage cakes and I was told the cake recipe follows the old cake tea production. 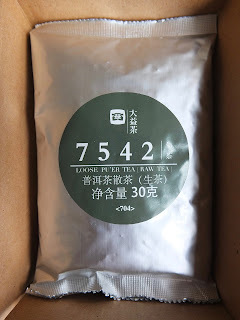 Information on the neifei, or enclosed label of this cake told me that this 357g cake used wild pu erh tea leaves found in the Bulang region of Yunnan province. I had bought this cake in 2011 during one of my visits to Kuala Lumpur, Malaysia. I sampled the tea and like it. There was also the 'Malaysia' print on the wrapper that made me buy this cake. This tea brews very strong. There is some bitterness, camphor, herbal and medicinal taste and aroma in the tea. I got a light pleasant buzz from the 3rd infusion and a little tea drunk with the next few cups. A nice tea....must remind myself to use less leaves for subsequent brews (I had used about 7g for a 130ml teapot). But I digress. I was told and I believed it myself that to look for new pu erh tea to store away and age, that new tea should be aromatic and taste strong. The logic being if the new tea is mild in taste and aroma, it would be unlikely that aging the new tea would result in a stronger taste and aroma. So choosing a new tea strong in taste and aroma might be a 'better chance' that the tea would aged better after a 7-10 years of storage. Happy to say that its 'so far so good' on my teas being aged in Singapore. Do you agree with me? Do share your thoughts. Thank you.